Share the Love: Donut You Know I Like You a Hole Bunch - C.R.A.F.T. Kristen is a local Austin blogger, turned real life friend! Her girls were models in my book and she even took my maternity pictures with Maxwell! And I love that Kristen has also participated in Share the Love since the very beginning. Be sure and check out her other cute, free prinatble Valentines: “Every Day I Like You Smore” and “Ahoy Matey! Be My valentine“! With Valentines, I like to do quick and easy. I wish I thought about it well enough in advance, but I’m not usually that organized. I’m a BIG fan of what I call treat toppers, and love to use them for all holidays. You can find several on my site in my Valentine’s section, but today I’m sharing this Donut Valentine Printable. By the way…I’m Kristen Duke, and I am visiting C.R.A.F.T. today from my site, Capturing Joy, where I share my creativity, travel adventures, and photo tips among other things. Jamie is my fellow Austin blogger friend, she lives “just down the road” from me, and I love getting together with her. She’s inspiring! You probably already have everything at your house to make this…except maybe the donuts. Just print, cut, add the donuts to your ziplock, and staple shut. Easy peasy! To download the “Donut you know, I like you a hole bunch” free printable, just enter your name and email address below and the free file will be delivered to your inbox! 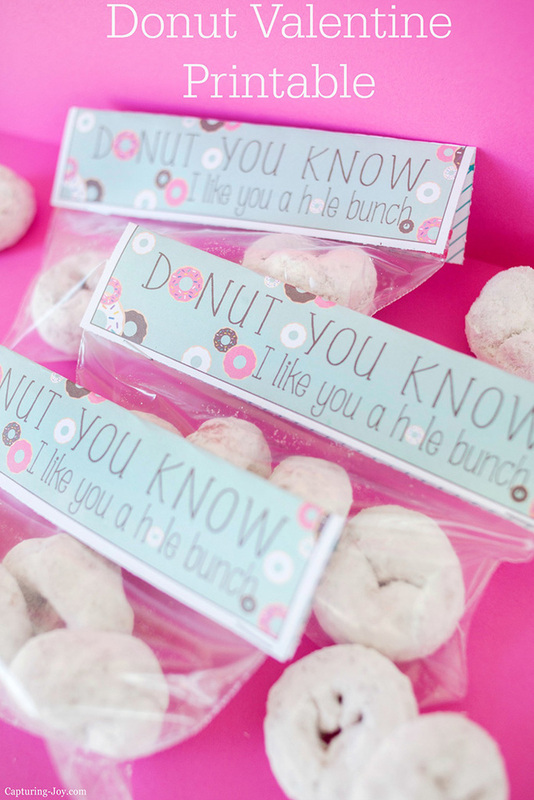 The donut Valentine bag toppers come 3 to a page. As an added bonus, Kristin also created a Valentine coloring page version, and you can grab that on my site today! My girls love to color and make their own creations, so you’ve got options! I love powdered sugar donuts! and glazed. and jelly filled sugar donuts! I know this may sound kind of crazy, but I think I’m going to use these Valentines for my grandparents! We live several states away from each other (so things have to be able to mail well) and my mom told me the other day that her parents really like the little powdered donuts 🙂 I know this will make them smile and my little guy (3 years) will have fun helping to put them together. Thanks for the printable!! Aww that’s so sweet! We so need to send the grandparents Valentines, they would love that 🙂 I mean who doesn’t love a Valentine!? Aww we made a Donut Valentine too! Yours is adorable!! Such a cute printable! Thanks so much for sharing at Oh My Heartsie Girls Wordless Wednesday! Love this! I think I will use this idea for my sons teachers!! Thank you! Such a cute idea. I bet the kids will love these. Thanks for linking up at the Best of the Blogosphere Linky Party! Cute, cute cute! Thanks for sharing this with us on Throwback Thursday!